Beef noodles are one of my favourite local foods. Although quite commonly found in the ubiquitous foodcourts strewn around Singapore, a good bowl of beef noodles is hard to come by. That's why I've been patronising this stall in Lavender Food Square for over ten years. In fact, it's the only item that I'll order without fail each time I pop by. 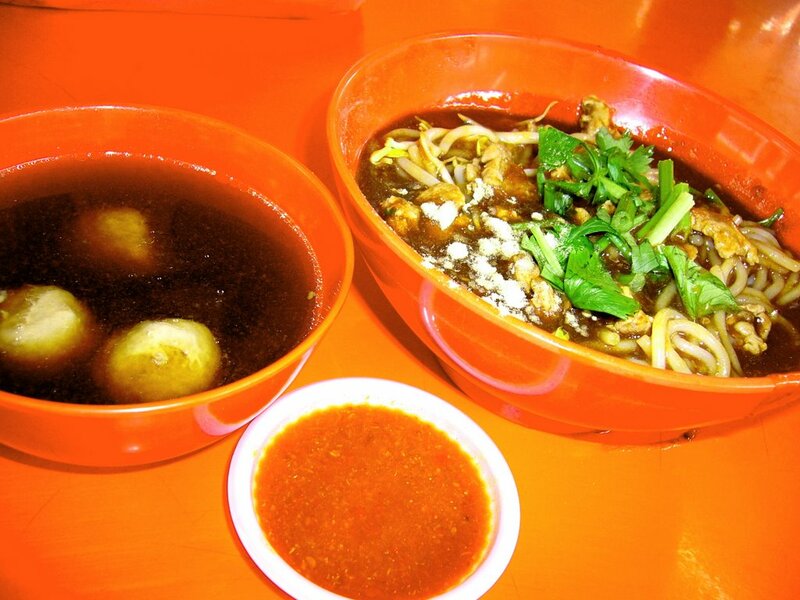 The stall, Bugis Street Ngak Seah Beef Kway Teow, serves a potent bowl of beef noodles. I ordered the Dry Beef Noodles with Beef Balls (not the testicles!) ($3) picking chor bee hoon (thick flour vermicelli) as the choice of noodles. The chor bee hoon and bean sprouts were blanched in boiling water before being tossed into a bowl. Next, slices of beef were briefly cooked in a beef stock and placed on top of the noodles. A thick, brown gravy was then poured over the above-mentioned ingredients. The tasty gravy had all the goodness of beef and hints of cinnamon, peppercorns, cloves and star anise. The gravy was further enhanced by juice from a freshly-squeezed lime. Lovely. Served together with the noodles was a piquant chilli sauce that was spicy and tangy. The beef balls were decent but I would have preferred them with more bite and less flour. A soup version with noodles or rice is also available and no less delicious. If you can't make up your mind on whether to have it dry or in soup, be like me, just order both. Chew On This: Add a few dollars to include beef tendon. The gelatinous connective tissue is all soft and chewy. A delight with the gravy and chilli sauce.